We started yesterday with a bit of visiting in the Diocese of Indiana. 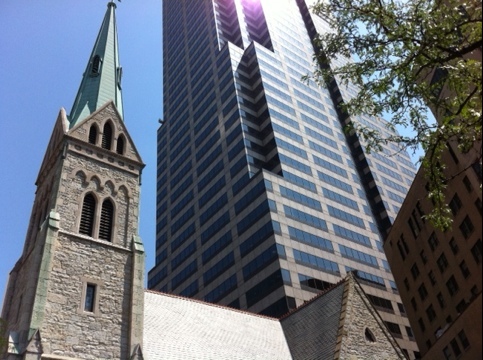 This is the Cathedral in the heart of downtown Indianapolis. It has been at the heart of a series of social and outreach ministries for those for whom the American dream became a nightmare. It was, as these visits are, very impressive. Voluntary-rooted agencies like these can still deploy remarkable financial fire-power – one budget was $20. Even more impressive and enviable was the obvious resource of a cohort of people available to be employed as leaders, managers and directors of these projects. They kept saying that the ‘not for profit’ sector is highly developed here and you can see that. 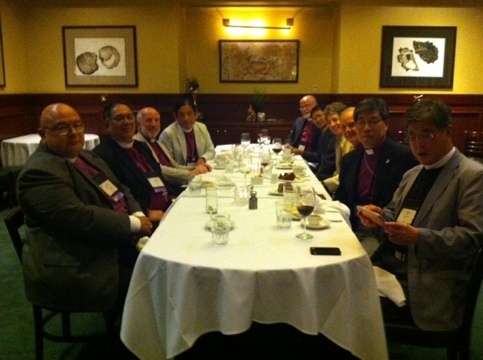 The day ended with a dinner for the visiting Primates hosted by the Presiding Bishop. Among those around the table are Mexico, Philippines, Japan, Wales, Brazil, Korea. We all know one another – particularly since we spent a week together at the Primates Meeting in Dublin last year.